Its summertime on the farm and in our lives. We are finishing up Degrees and Inspections across the State. I thank all Grangers for their hospitality given to the inspecting Deputies. Reports will be going out soon. In the Degrees I always like the “Sifting Song”. Especially the second verse, “Sift out fair virtue, love and truth, From envy, hate and strife, Write deeds of love and charity On each fair page of life. Sift to the right, sift to the left, sift backward, too as well. Sift up and down and forward sift, and make your sifting tell.” To me this song tells us that we as Grangers are to not judge others but to accept them for the potential good they have to our grange family. We should all re-read the degrees and songs for the vital lesson they offer us to be good Grangers. Let’s Celebrate was well attended and many enjoyed the talent contest in the afternoon. I thank the CWA Committee for their hard work on the needlework contest and the decorated flower pot contest. I thank the Youth and Junior committee for the Shepard’s Pie luncheon, even though we ran out of salad, the dessert made up for that. I thank our Chaplain Charles Dimmick for the Grange service in the morning and our worthy Lecturer for hosting the A Number and talent contest. The weather was hot and the friendship of all was comfortable. Congrats to the winners. The National Grange is seeking our support in donations for the Trademark fund and legal costs for the California State Grange Lawsuit. Letters have been sent to your Granges asking for your donations. 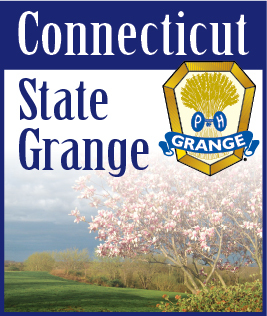 The National Grange is looking for a $10.00 donation from every Grange member in Connecticut. Please give if you can, this may delay another dues increase in the future. The New England Grange Building at the Big E, will be selling jams and jellies and needlework items again this year, the building will showcase new windows, columns, and a fresh coat of paint. The Grange rooms upstairs will be opened on the weekends and only it staffed, so I will be asking for volunteers to staff the rooms and those attending Grange Day, Sunday September 28. A reminder to all Granges, read the digest before any decisions are made, in selling property, liquidating funds through donations, and selling Grange halls, and surrendering of your charter. The Digest is the rule book of the National Grange, which we all operate under State, Pomona, and Community Granges all. If you have questions ask the State Master or the State Board of Directors for answers. They may not the answers you want to hear but they will not get you in trouble with the National Grange. In closing this month I want to get back to the “Sifting Song”, for all of us to reflect upon. “And while your’e sifting don’t forget to always sift yourself.” Happy summer too all.